just up the pike: why are all the poor kids sitting together in the cafeteria? why are all the poor kids sitting together in the cafeteria? This got me thinking about how race is treated in snoburbia. In the local snoburban high school, kids mix seemingly without regard to race . . . But when I look more closely at who all of these kids are, it becomes clearer. No matter the race, all of the children are advantaged, from educated parents. Some of the blacks and Latinos are children of government bureaucrats, scientists or diplomats. Some were born in another country. But they all have at least some money and educated parents. Left out of the snoburban teen social groupings are black and Latino kids from the less fortunate neighborhood. (There are virtually no poor white or Asian kids around here.) Those kids also attend the same high school, but they talk and dress differently. They live in one or two pocket neighborhoods and ride the school bus. They don't go to the same parties or even to the same mall. They are more on MySpace than Facebook, so their online social interactions are limited; this aspect is rapidly changing, however, and may already have changed by the end of this paragraph. 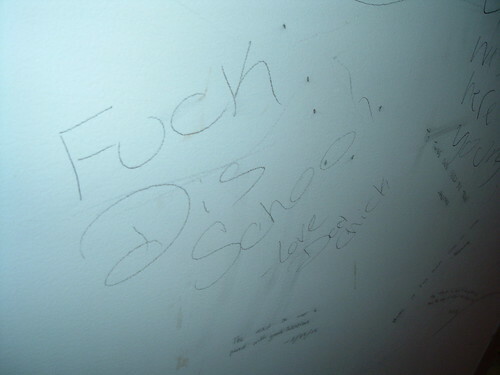 Graffiti at Blake High School, 2005. Dominique Johnson, 13, who attended an elementary school in the District before moving to a public housing apartment in Bethesda, said the difference was obvious. "It was a bad, bad school," she said of her old school, shaking her head. "The principal, I don't think she did anything about all the fights. I had this one teacher who would curse at the kids." At North Bethesda Middle School, she said, she found rules, focus and difficult classes with attentive teachers. Her grades dropped. But after a year or so, they improved. On top of that, the study says that Montgomery County's affordable housing program has made it possible for low-income families to actually live in its most coveted school districts. So: affordable housing means that kids get into good schools, meaning they have a better shot at having a good, prosperous life. It doesn't sound like they're the incubators for crime and poverty that some people make them out to be. But according to Lydia, it doesn't mean that those kids are necessarily welcomed with open arms when they get there. We're winning the battle, but not the war. I have always said that socio-economics -- not race -- is what truly divides people in this country. It just happens to be that certain races are more represented in certain socio-economic classes. Since I'm not a kid anymore, I can't really comment on why children of different socio-economic classes sit at different tables, despite living somewhat together. But as an adult, I can shed some light on this: By and large, people from different socio-economic classes have different tastes, interests, hobbies and passions in life. People like to hang out with people who share similar interests. I enjoy discussing serious and civic issues when I hang out with people. I also enjoy talking about technology and computers. People with college degrees and a Web background are much more likely to want to discuss mobile application user interfaces and experiences than people from lower socio-economic backgrounds. I'm also much more likely to get an honest and earnest debate about tax policy and the deficit with a college educated person (especially someone who did well in school and went to a good school) than someone who isn't. I also get together with people in the same field, and we discuss ways to innovate and do our jobs better. I would enjoy sitting down with you and discussing urbanism and mixed-use development. I do have friends who work blue collar jobs and don't have college degrees, but all of those friends date back to high school. Since graduating from college, all of my new friends and acquaintances are professionals, many of whom I met through work or work-related events and conferences. Unless people of different socio-economic backgrounds suddenly acquire the same tastes, interests, hobbies and passions, it would be silly to think that they'll regularly hang out together. I would imagine imagine that children of different socio-economic backgrounds acquire much of what their parents care about and their world view. Perhaps this can partly explain why children of different socio-economic backgrounds don't want to hang out. This is more a matter of the neighborhoods, social gatherings, and other events or groups in which people of different income levels are brought up together than the out and out fact that they are of different economic backgrounds. Wealth and high school cliques do not necessarily have a causal relationship. I would definitely argue that it is merely coincidence that people of lesser economic means grow up together doing the same things together, and those of greater economic means grow up together doing the same things together. And when in high school, the same kids are going to want to hang out with people who they feel comfortable with. For example, when I was in high school, I didn't have many wealthy friends and those friends that were wealthy hung out at different venues and did different things than I did. I simply didn't feel as comfortable with them as I did with people of largely similar economic means. Perhaps if those of the so-call upper class would invite a member of a lower class to lunch or dinner- they may find there is more in common with both of them than you think. It is always amazing how a lot of common interests these people have- whether it is politics, books reads or some other subjects. Usually the well to do think they are doing their good deed by going to a shelter and dishing out food-they homeless and the poor will get fed whether you are there or not- but invite one to your home for a holiday dinner- you might learn something. Where is all this guilt coming from? The statement by the White dude" is insulting. He's projecting his own failures on to these kids and he doesn't even know them. If he really wanted to do something for these kids, instead of lamenting on their inherited misfortune, he could help them develop a sense of pride in themselves. Being poor and/or "disadvantaged (whatever that means) is not a crime, nor does it preclude you from the best life has to offer. Do I need to site a library of examples? It's socialist, progressive policies that kill these kids - "Just sit back, cause you'll never amount to anything, but guess what, those kids over there will and they'll take care of you" BTW, get a drug problem while you're waiting for your welfare check to roll in - have another kid... You folks (i.e. Snoburbia, and "followers" are feeding the beast. Patrick hit on it: Socioeconomic policy is the key. Create jobs, and bring back pride of ownership, personal responsibility, create jobs. DON'T bring me a guilt based social program designed to attempt equal result "for all". "On top of that, the study says that Montgomery County's affordable housing program has made it possible for low-income families to actually live in its most coveted school districts. So: affordable housing means that kids get into good schools, meaning they have a better shot at having a good, prosperous life. It doesn't sound like they're the incubators for crime and poverty that some people make them out to be." While I'm at it - the above statement is less than astute. Affordable housing is a socialist program of welfare for the middle class. It is government intrusion of trying to micromanage the lives of the citizens instead of allowing free market forces to work. Let people live within their means. My child has always formed friendships with her intellectual equals. It has never been a case of socio-economic status, however these kids unequivocally discuss, like and share the same interests. They often use and own the same technology (they can afford iPhones and other gadgets) wear the same clothes (Ugg boots, Juicy Couture)all which cost money. Now imagine a kid from a lower class trying to make friends with kids that have all the things they don't. As an adult, you're more secure and might enjoy the diversity. Around middle school, the thought of sitting at a lunch table iPhone-less with kids that have those gadgets is unbearable. There's not much you can do to force teenagers to eat lunch together or socialize out of class. You can make sure classroom demography is done without regard to class. You can make sure that lower class children aren't slipping through the cracks and missing educational opportunities in high school. You can make sure everyone is getting the educational enrichment and health needs met from fetus to high school graduation. If all that is happening, it might affect lunch table socialization, but it would simply matter less. I went to Friendly Sr High in Fort Washington. My fellow students were drawn from a strip that stretched from a poor areas called Southlawn by the Beltway through our middle class/working class area down to a wealthy neighborhood by the Potomac. Absolutely, the grouping was by social/economic class. The "Tantalon kids", the way we said rich kids, ran in two groups: those that had WAY more money to do things than the rest of us (lots of drugs, good cars, concerts at Cap Centre regularly) and the kids from familes who had that big house in Tantalon but couldn't afford furniture or anything else beyond the house. The first group was mostly white, the second group was a mix of races. On the other extreme were the kids from Southlawn, up toward Anacostia, almost all poor and black. They had their own parties and so forth. In the middle, we were all sorts of races, recent immigrants as well as people who'd been in the US for generations. Those of us in the middle had the highest amount of parental involvement. We rarely saw the rich parents and the poor parents always seemed to be working. Looking back, it was sort of a gradation from black Southlawn to white Tantalon (the folks with a lot of money). The one place the lines broke down were in sports. I played basketball and was on the track team. Both groups were from any of the neighborhoods, but now that I think about it, we had our parties for the kids in sports but only a few people crossed the socio-economic lines for the other parties. Where I live, there's a very strong divide along multiple axes: "apartment/condo people", "new wave homeowners", and "old school homeowners". I can't speak about the school issues, but as to the rest of the neighborhood socialization issues, it's "one step away from open war", to quote Nancy Navarro at a recent Candidate Forum in Aspen Hill. The apartment/condo people mostly seem to come and go, though some of them have been in their same digs for years and years. For example, a lot of the HOC folks at Bel Pre Square have been there "half of forever" and they're a very solid, if poor, community. Yet all of the long-timers can tell you about the problems they have with a good number of the short-term residents. The "new wave homeowners" versus the "old wave" is a very strange and sad situation. Leaving out of the discussion anything to do with nationality or ethnicity, a lot of the new wave bought insanely overvalued "previously-owned" residences, and a lot of the old wave bought those properties when they were new, or not far from new. To have bought a house in the "new wave" era, if you weren't playing games with variable-rate or "interest only" loans or "liar loan" mortgages, you had to be pretty well-off; to have bought these homes when they were new or nearly new, you just had to be barely in the middle class. A lot of the newcomers consider the people who paid off their mortgages 30 years ago to be "poor white trash" or uneducated rednecks. A lot of the people who have lived here all of our lives think of this sort of newcomer as "pompous yuppies with too much baggage". While it's less common for folks living in their long-time home to have adult children living at home sending kids to school, than it is for newcomers to send their kids to school, but it does happen, and I have to wonder how those "class issues" resolve. What with the Middle Class being actively deconstructed every day now, and with that we're seeing a return to "traditional nuclear family multigenerational" patterns instead of the "parents and kids only" pattern, how reasonable is it for the rich to despise the non-rich for living as economics requires? I think another big social divide comes after school--at Blake, kids with transportation can stay for band practice, late theater rehearsals, etc., and can come to evening activities. There's no county (activities) bus or Metro bus late enough for some of these activities, so students have to rely on parents to pick them up (or drive their own cars). And Blake is a long, sidewalk-less walk to New Hampshire, to catch a Metro bus home. This makes it difficult for the students from the poorer, more distant neighborhoods (especially kids who live in White Oak, in apartment complexes) to participate in many activities.